Blog on life, the universe, and politics. You are currently browsing the tag archive for the ‘Pride’ tag. Right now is an exciting time in our church community, as we launch a new church from First Baptist Church London, called Maitland Street Church. The team that is dedicated to the launch is meeting several times a week in a flurry of enthusiastic activity to iron out details as well as prepare the building (819 Maitland Street) for services starting in the fall. When I first committed to the project, I was likewise excited at the prospect of starting a new church founded on a philosophy of community, relationship and service. But I’m struggling to remain excited, at no fault of the church or the people there. I’ve always been hesitant in my Christianity. I came to faith in my early 20’s despite strong misgivings with many aspects of the global church and my experiences growing up (I wrote about it in more detail in my post What I Believe), and am always conscious of the associations that are created by saying I believe and attempt to follow Jesus Christ. Even as we prepare for our new church, one that may be the closest thing I’ve found yet to a church I may be truly comfortable to call home, I feel more conscious than ever of how much Christians are in the news, in my mind, for all the wrong reasons. This summer a debate has raged in Texas and elsewhere in the United States over female reproductive rights, with conservative Christians leading the charge for draconian measures that will put many lives in jeopardy. Even as a major victory for equality and civil rights was won when DOMA (Defense of Marriage Act) was declared unconstitutional, conservative Christian groups across America continue to push to keep the definition of marriage only one man and one woman. Though it is absolutely no cost to them or their relationship, these conservative Christians are working to continue to deny thousands of homosexual couples the rights heterosexual couples enjoy. Closer to home, the news isn’t much better. The bad news is that hate crimes against the LGBT community across the country rose by 10 per cent in 2011 after an increase in 2010 as well. Local numbers weren’t broken down by race, religion or sexual orientation, but Pride London Festival president Andrew Rossner believes the local LGBT community is still too often the target of abuse. Far too often the Bible is wielded by ignorant minds and inept hands as a cudgel instead of a message of support and encouragement, and Christians the oppressors instead of allies. In a Metro News article written yesterday on a Pride London event called Ignite Pride (hosted by Aeolian Hall, mirroring other successful events such as Ignite London and Ignite Health), the one commenter chose to quote Romans 1:18 as a Biblical example of why homosexuality is apparently sinful. Pastor and author Mark Sandlin has written the best commentary I’ve read about this kind of misappropriation of scripture, calling such methods “Biblical” gay bashing. I also wrote this post last summer on sexuality and scripture, and why methods like this of lifting text in an attempt to make a point not supported by the entirety of the Bible does a disservice to God and to scripture. 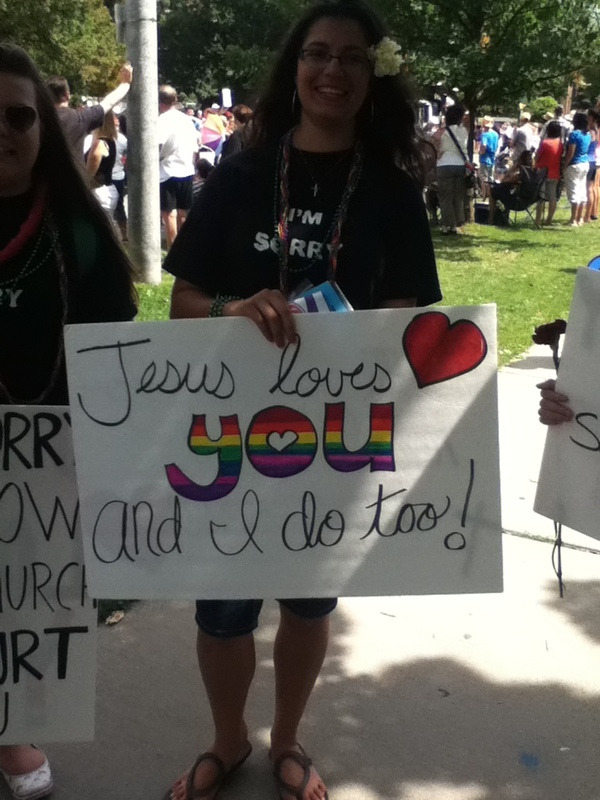 When I marched in the Pride London parade last year, the only mar on an otherwise great day was the clusters of people holding signs along the parade route with scripture similar to Romans 1:18. Unfortunately, so often when I think of Christians, this is what comes to mind: people that worship the same God I do, but (in my mind) doing it so very wrong. What I struggle to accept that we are all part of one broken, splintered and diverse church. And, there are many that are just as unhappy that I’m part of the fold. I discovered that day that there are many people that believe like I do, including the directors of a London “Centre for Spiritual Wellness and Exploration”, called Sabbath Place. They conducted a church service in Queen’s Park before the parade got underway on the spirituality of sexuality and on how we are all God’s children. I’m so glad that I happened upon the gathering that day, in doing so I’ve made new friends, and found much needed renewal of my faith. It also helped me to reconfirm my commitment to the church and the community, something that in writing this I hope to do again. I struggle as I see so many Christians doing what I see as so much damage to the world and each other, but have found that there are others that think as I do, and are willing to remain in the church despite so much pain, knowing that it would be much easier just to leave, knowing what is easy is almost never the right choice. I know that we need to be the change that we want to see, and that if I were to just turn my back on the church, it would only become even more of what I despise. And we all have so much we can give to the church, and there is still so much the church can do for the community. Churches continue to be one of the foundations of many communities, supplying counseling, support, encouragement, food and shelter to those that need it most. This is what I want to focus on as I think of the new church we hope to build. The goal is to create a church founded on community and support, being a relational centre where the members are there for each other, but much more importantly, are there for their community at large. My hope is that I participate in this church by connecting with the community associations in the area and finding ways that we can support each other, while drawing further experience that may assist the Argyle Community Association as well. There are brief moments (including the Awesome London pitch party this week) where I see and feel the power of collaboration and what people can do together when they share experiences and assets to the benefit of all. I hope that as our communities and L0ndoners in general discover their strengths and those of the people around them, these experiences will only grow. It can be daunting, but it is so important to stand up for what we believe in, and surprisingly community connections can be made when we do. I can’t wait to celebrate Pride London again this year, it is so important to stand up and be seen as an ally, and to celebrate our LGBT brothers and sisters. If you’ve been out to Pride before, I hope that you’ll be there again, and if this is your first time to the event, I especially hope that you’ll come and see what it is about! Pastors often say that to be truly living a Christ-centred life you need to follow God out of your comfort zone. As a Christian, I feel that it is our duty to give voice to those who are marginalized, to be an ally to those who need support, and to remember that the most clear instruction we receive from Jesus was to love others and love God. If we start looking at the world through the lens of love first, everything else second, it becomes absurd to say my books says you and your partner should have different chromosomes to be together. Step out of your comfort zone, and love extravagantly. That, to me, is the real purpose of the church. To Stand or to Judge? I grew up in the small town of Wiarton, Ontario. Like many other towns, it has a small population (2,291) yet contains at least 10 distinct churches. Growing up, I had many people (classmates and adults alike) lecture me about not going to church. However church had no attraction for me, especially as those I spoke to didn’t seem interested in inviting me to join the church as the body of Christ, but only to tell me why their church was superior to everyone else’s, and to make sure that I started going to the “right one”. Any person with this attitude gives me a great deal of concern, for the damage they do to the global church body by believing that their way is the only way. It damages relationships, and it stunts potential spiritual growth. I began to avoid the company of people who would try to lead me to join their church, no matter how well-meaning their invitations may be. It was only until college that I met a chaplain that was a leader at Fanshawe, and through many conversations and cups of coffee that I explored my spirituality, and ultimately became a believer in Christ. As I continue on my journey, I have become more and more concerned about the damage the church does when it chooses to condemn. Living in Wiarton, I encountered many forms of prejudice, but perhaps especially homophobia, and most especially from those that I consider to be the most devout church-goers. This always surprised and appalled me, because the impression I had from my limited understanding of the Bible was that Christ had died on the cross for all people and all sin, and that all were welcome to partake in and share the Good News. In my child’s mind, these two realities shouldn’t have anything to do with each other. It wasn’t based on real-world understandings of homosexuals. Several of my classmates have come out since graduating from school and moving from Wiarton. Unfortunately the atmosphere there was far too oppressive for anyone to be willing to be open about their sexuality while still there. It seemed no one that I knew had encountered a “real” homosexual, they only knew that the Bible told them (and often, their priest/pastor preached) that it was a sin. I firmly believe that Jesus would have us stand up for our LGBT brothers and sisters, instead of being part of the force that stands against them. Before the Pride London parade, I happened to meet Karen Low from Sabbath Place, and heard her pre-parade sermon delivered in Queen’s Park. She was kind enough to share her sermon notes with me, I’d like to share a portion of it here. And as we gratefully look into this circle of the spirit, we also turn our attention outward to see the millions who live lives of quiet desperation, to feel the suffering of those who exist without freedom, to hear the cries of those who struggle against the bars of injustice, praying and striving for the realization of that day when love becomes a palpable force in all lives and where all people know of their essential unity. Here at home as well as all around the world, the LGBT community continues to be oppressed, partially by Christians, despite the fact that sexuality isn’t a choice someone makes for themselves. As we contemplate Karen’s message, we must remember Jesus’ message of peace, love, acceptance and understanding. I believe that Christ would have us stand with our LGBT brethren, not against them. Last Sunday I participated in the Pride London Festival parade for the first time. I had been out to see and support it before, and was very excited to be a part of it even though I didn’t entirely know what to expect. I walked through Queen’s Park, headed to the Western Fair Market parking lot where all the floats and different groups were assembling. As I walked I found a group of people listening to a speech being made by a woman behind a podium draped in a rainbow flag. I discovered after that the speaker was Karen Low, United Church Minister and co-founder of a “Centre for Spiritual Wellness and Exploration”, called Sabbath Place. She was delivering a sermon before the parade, speaking about sexual acceptance and spirituality, and those that are suffering may be the people spiritual centres should be reaching out to most, instead of turning away. She concluded with a soulful prayer of compassion and connection with all those that have been persecuted, struggling with identity and isolation, and for those that continue to struggle today. She and her partner Debra Low were extremely welcoming and interested in speaking with me more about their beliefs and organization, I look forward to connecting with them further. Feeling very encouraged and ready to join others for the parade, I soon came to the parking lot. I knew that the parade has been growing every year, but I still wasn’t prepared for the sight that awaited me. Along with the main floats, organizations including the LPS, OPP, Children’s Aid Society, TD Bank, Rogers Media, London Roller Durby, London NDP, London Liberals (who I was marching with) and many others were there, loud and proud. It was terrific to see so many people come out in support. For the second year in a row Mayor Fontana was there, NDP MP Irene Mathyssen and MPP Theresa Armstrong joined their party and Ontario Ministers Chris Bentley, Deb Matthews, and Kathleen Wynne joined us. As we got underway after 12:30, we watched as all kinds of different groups fell into the procession, until we joined in behind the OPP. The crowds watching the parade were somewhat sparse at first, a combination of supporters and curious onlookers watching from their porches. 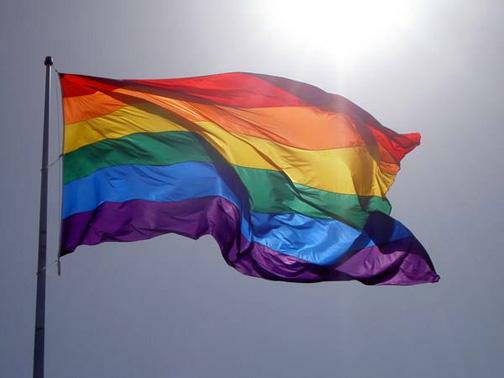 As we got closer to downtown, spirits swelled as the crowds thickened, with many people cheering and showing their support with flags and rainbow clothing, including a massive house with multicoloured streamers flying from the porch and windows. The only low point was a group of 5 or so people near the downtown, silently holding signs with short sections of Bible scripture saying homosexuality is sin. They mostly had the same message since they don’t have much material to work with. The sight frustrated me, but as someone with me pointed out, at least they were doing it silently. For the parade’s part, there were many calls of “No it’s not!” and “We love you anyway!”. The atmosphere remained jubilant, and we were soon past them. And then, we saw a group holding signs like this, wearing t-shirts with the simple message “I’m sorry”. Simple, and so beautiful. The group smiled and offered their arms to anyone that wanted a hug. Many from the parade stopped to thank them for their message and accept their offer. There were more than a few tears. As we came into the downtown, I was overwhelmed by just how many people were there to watch and cheer. So many people in bright clothing, waving flags greeted us as we made our way to the end of the parade at the Festival’s new home in Victoria Park. I’ve been thinking a lot about Pride and why it matters as I wrote in this Metro article. I don’t often talk or write about my faith, but it is something I deeply struggle with. I belong to the community of First Baptist London, identify as a follower of Jesus, and I believe that there is no sin attached to one’s sexual orientation. I want this to be the first in a blog series about faith, homosexuality, all the reasons why they don’t need to be mutually exclusive, and why faith communities should be especially welcoming to everyone in the LGBTQ2 community. I hope to learn more about this entire issue, meditate on what it is I believe, and write about it as I go. If you’d like to discuss this with me and share your insight, I’d be very glad to hear from you! You can always reach me over twitter at @briangibson13 as well as on Facebook.